Buy your New York TV Show Tickets before you go to New York and enjoy a late-night comedy talk show. You’ll first get into the mood with a guided walking tour past well-known media and broadcast spots in Midtown Manhattan, then skip the line for VIP seating to watch a famous New York TV show! You’ll be part of the live audience and be able to see what goes into taping a TV show. Before heading into the studios you will enjoy a guided tour of Midtown Manhattan. Your guide will explain in detail how the entertainment industry works in New York, and answer any questions about late-shows or TV shows in general. You’ll pass buildings like the Time Warner Center, the CNN headquarters, Hearst Tower – headquarters of the mass media empire Hearst Corporation – which owns magazines like Cosmopolitan and Elle but also TV channels such as ESPN. 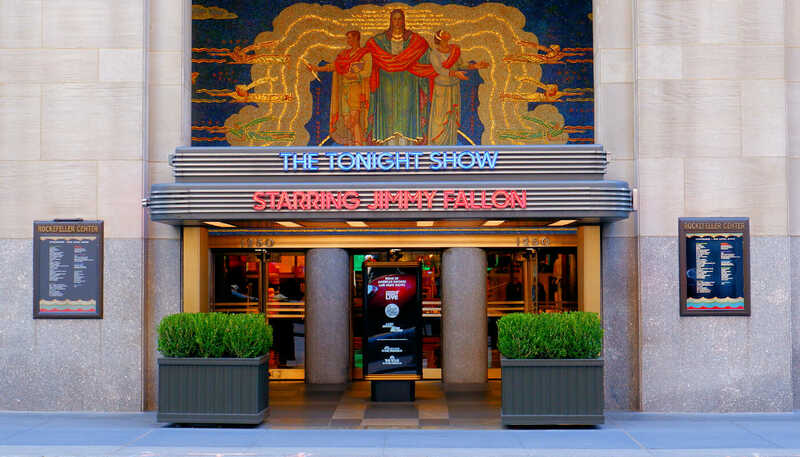 Next stop will be the studio of Jimmy Fallon (where David Letterman used to host his show). When you buy your tickets you won’t find out which TV show taping you’ll be attending; it’ll remain a surprise. This is because the TV studios do not allow for advertising a show’s name beforehand. But don’t let that deter you! everything on the stage acquires a different dimension. You’ll never be able to watch TV the same way again! The taping takes 30 minutes, but the fun doesn’t end there. After the show you’ll get a behind-the-scenes look at deleted scenes and retakes. You’ll see why editing is important and you’ll understand how TV actually works: There are a lot of tricks to make you believe in magic, but it is worth it! 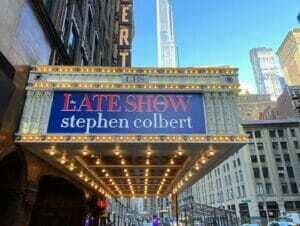 Eric’s Tip: You don’t know which late night show you will see until the tour starts. It will be a show from a big TV station. It might not be the one that you were hoping for. If you book, book this tour for the experience to have been to a live TV taping of a show that you can see that night or few days later on TV. After purchasing, you will receive a voucher that you can print out and use as your ticket for the tour.